Have you ever tried to take your words backs after saying it to someone? Yes! it’s not possible we know that. But in your professional life, you can easily get all the emails that are sent to someone wrong can be taken back. Like the feature of Whatsapp in which you can easily delete the message that you have sent, in the same way, you can easily get the emails back in your Outlook account. This feature empowers the user to revert sent mail in Outlook account.This feature of Outlook is so prominently used these days that lead Outlook to add some extra security measures in this part. This extra layer of security to recall a sent message in Outlook or undo the erroneous email messages helps a lot of users who might have sent the emails accidentally. Many professionals have enquired asking – ”how do you recall a sent message in Outlook 2013” but the detailed solution they haven’t received. Don’t worry we will let to get all the information about the method to recall sent message in Outlook 2013. Forensics of Outlook turned out to be much more easier. Learn more about Outlook Mac Forensics and Outlook.com Forensics and embrace an extra level of security with your Outlook account. Undo sent messages option is only available in Exchange environment. Users can retrieve email message from a recipient mailbox who haven’t read the message. Moreover, only those email can be revert in Outlook if the recipient also has Exchange account. Outlook user can also send a replacement message. For example, a user sends an email message and forget to add an attachment. So, he/she can recall the sent message and then send a new email along with the attachment. Then, open Sent Items folder. Select that email message that needs to be recalled. Click on Message tab, select Actions. Now clearly follow the step by seeing pressing Action menu will pop up. You need to select revert sent mail in Outlook. This will get all those emails back in the Outlook account. After performing this step you would see the dialog box that will help you to proceed forward. Select emails should be deleted unread copies of this message. You need to click on OK button to recall sent message in Outlook. If you want to send a different message to the place of recall message, then compose it. After that, click on Send option. Note:- If the option of recall message is not available in your Outlook 2013 account or any other version this means that you are not using Exchange account. The option of Outlook to recall the sent emails back to Outlook account is only possible if the user gives out the proper feedback and improvements. After a lot of effort, Outlook has regained the ability to undo a sent message in Outlook account. Let’s know the internal working of the process that runs behind to recall sent message in Outlook. When you click undo sent emails back to Outlook account a substitute message is received to the same recipient in Exchange environment. Then in public folder in which you want to revert the emails would start the process that requests the SMTP server to generate the token that checks if the message is read or not. If not then it is considered for further processing or in which Exchange Online revert sent mail in Outlook. 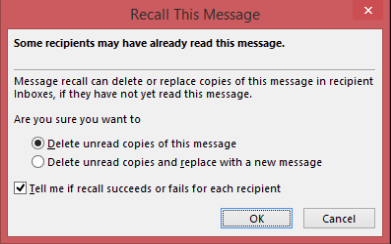 The original message is then removed from the sent box and then it is moved and the recall sent the message in Outlook 2013 or any other version is accomplished. It’s recommended to all users to move a step closer towards cloud and migrate Outlook PST file to Office 365 account and get more familiar with Office 365 cloud. To know more, visit here: https://www.office365import.com/. Recall This message feature helps the Outlook 2013 user in a various way. On a fundamental level, it giving the power to recall or retrieve the embarrassing and faulty email messages that sent occasionally. So, it is good to aware of the Outlook 2013 inbuilt feature. Hence, we have provided a step-by-step guide to recall sent messages in Outlook 2013 in a proper way.